We love to travel abroad. Last summer we packed our bags and took a plane to Colombia. This beautiful, diverse South American country had so many things to offer, we should’ve planned for more than the two glorious weeks we took. We traveled with four kids, ages ranging from 8 to 4. Let me tell you, yes I was nervous at first because for three of the kids, it was their very first time on a plane. We spent the weeks before the trip preparing them for any possible scenario. Fortunately, although they are little, they are smart kids. We went over safety rules, different foods, how to behave on a plane, cultural differences, language differences, and safety rules one more time. I was satisfied that they had learned at least a little after my constant (almost obsessive) repetition. By the way, we budgeted our finances in order to travel with the whole family. It takes effort, but it's totally worth it! (click here for how to budget to travel). The day came. Five adults, four kids, lots of bags…. Well, not really, we tried to travel light. We knew we had an eight hour layover in Panama, so we were prepared. (See What to pack TIPS when traveling with kids ). We had activity books, portable DVD player, cards and little games for them to play…and snacks; plenty of plane-friendly snacks. BUT, we didn’t count on the almost infernal heat at the non-air conditioned airport. Neither one of us had ever traveled through that airport before, so we didn’t know what to expect. Apparently the airport was under construction and only a very small part of it was air conditioned. Well, needless to say, we spent 7 of the 8 hours in the AC area. The kids were comfortable enough and really tired by the time we got in the last plane to Colombia. They all fell asleep. When we finally arrived to the city of Pereira, one of the main cities in the heart of the“Coffee Triangle”, we realized that hubby’s bag was missing!. The airline in Panama failed to transfer it to the next airplane. After the aggravation of setting up a lost-bag claim, we were greeted by some of our family that lives there. They had also rented a bus to fit us all and transport us around. We had to accommodate all of us in a small three bedroom apartment. It was tight, but it wasn’t terrible. It was hot thought (thank God for fans and micro-fiber cooling towels). We toured the city the first day with no problems. We also had to shop for hubby’s clothes since he had nothing to change into. Note to self: sizes in other countries are slightly different from the US. Large there is NOT like a large here. We quickly learned the lesson in apparel shopping, but not before we had already purchased some items. That didn’t stop us from having fun. Our first destination was a natural hot-springs pool park of Termales of Santa Rosa, up in the central mountain range, about one hour from where we were staying. It was hot in Pereira, but this place was cool and comfortable, although it got a little cold at night fall. The hot-spring in this area was a natural volcanic spring that flows from an impressive waterfall at 158° and reaches the pool area at 104°. Once the water enters the pool it is combined with cold water to make it comfortable and soothing. You can even smell the volcanic residue in the air. It was amazing and the kids loved it. 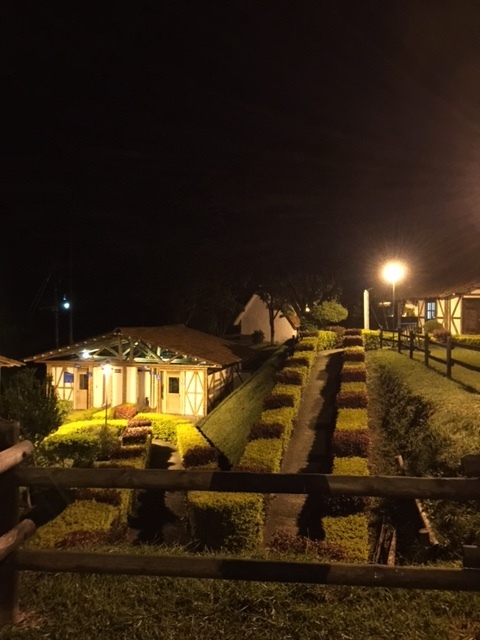 After this day experience, we went to a sports/waterpark complex called Confamiliar Risaralda- Parque Consota, and stayed in a beautiful cabin while enjoying a semi-private pool and all the amenities of the park. Fresh coffee was served each morning by their friendly staff dressed in typical- coffee region attire. In the meantime, hubby’s luggage was still in limbo. Way into day four, we were able to recover the luggage, along with the comfortably fitting clothes of a 6’5” man. He was happy, and we moved on to the next destination; a country house outside the Pereira. We relaxed for two days laying in hammocks and cooking out in the outdoor kitchen. The kids had a wonderful fenced space to play around and breathe in the fresh air and also fishing. DESTINATION #4 was a Coffee-themed amusement park. We all enjoyed this place tremendously. Filled with roller-coasters, water rides, theater, music, and eco-friendly walks, this coffee-themed park was both informative and fun. Kids are singing, and we are all admiring the view. We arrive to “Salento” and first on our list is horse-riding in the Cocora Valley, part of the central Andes Mountains. Horse-riding in the Andes was, in my opinion, what the kids (and the adults) enjoyed the most. The gorgeous views of the mountains, and the small colonial town of Salento, Quindio, with its multicolor colonial architecture were breathtaking. Salento also had dozens of small stores full of handcrafts and souvenirs for tourist. The locals are friendly and the food is fantastic. (Read our blog about the local food!). We spent the rest of the days in between walking around the city, shopping, and eating local food. The kids behaved great and we felt safe and confident to even go out at night (we got a sitter for that ). Read about the interesting encounters (with pictures), and the adventure back home… which includes a complication, in Part 2. Also stay tuned for a complete list of what to pack when traveling with kids. See more pictures in our gallery (Pics & Art) tab.